Update: I recommend using a different free antivirus program over this one - UnThreat AntiVirus is no longer being updated by its developers, nor is it available for download from the official UnThreat website. While it's probably still safe to use, I do prefer software that's still maintained like avast! Free Antivirus. 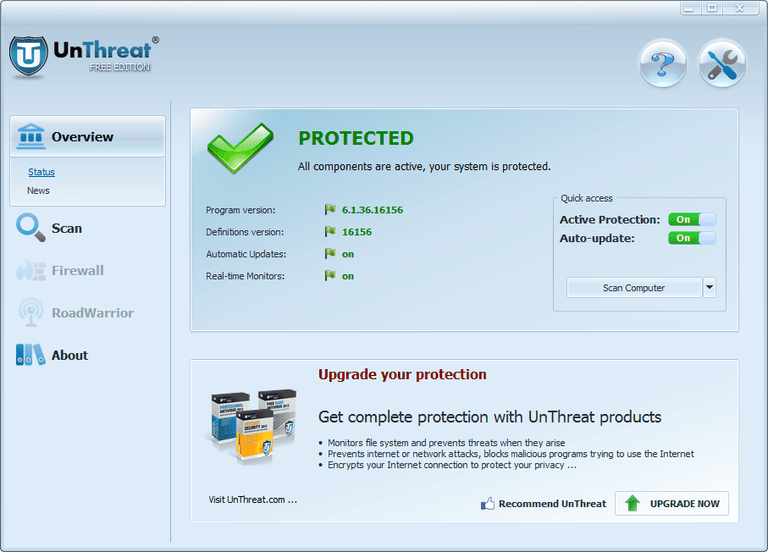 UnThreat AntiVirus is a free antivirus program. It provides a built-in email scanner to scan all inbound and outbound messages, which is really nice. Although the software itself doesn't seem to update very often, it still able to download new virus definitions when they're available. UnThreat AntiVirus provides constant virus protection, also called on-access or resident protection, for free. This means that UnThreat AntiVirus can completely replace antivirus software from companies like McAfee and Norton that charge for their software and for yearly access to updates. I found UnThreat AntiVirus really easy to use. The program layout isn’t hard to grasp and it’s easy to scan files and folders from the right-click context menu. Outbound emails that UnThreat scans are marked with a message that says they were scanned with the antivirus program. You can remove this from the Email Protection options in the settings. Something I didn’t like about UnThreat is that a large advertisement to upgrade to the paid version is always present at the bottom of the program that you can’t minimize or exit. There are so many alternatives to UnThreat AntiVirus that you should never feel like you must pay for antivirus software, especially just because UnThreat no longer offers such a program. Like I said above, UnThreat AntiVirus is still being updated to provide a defense to viruses and other malware, but there are some alternatives you may prefer. Start by looking through my list of free antivirus programs to find out more information on popular security software like Avira, Immunet, Comodo, AVG, Microsoft Security Essentials, Panda, Bitdefender, Zillya!, and Ad-Aware. Is Amiti Antivirus Worth the Download? Is Avira Free Antivirus Worth the Download? Is Baidu Antivirus 2015 Worth the Download? Is Comodo Antivirus Worth the Free Download? Is Adaware Antivirus Free Worth the Download? Is Bitdefender Antivirus Free Edition Worth the Download? What Are the Pros and Cons of AVG AntiVirus Free? Is ZoneAlarm Free Antivirus + Firewall Worth the Download? Is the Immunet Antivirus Program Worth the Download?